On October 9th, Merit Construction was very proud and excited to be included in the ground breaking ceremony for the Diocese of Knoxville’s new convent. Please check out the news coverage and photo gallery of the event below. Published on October 20, 2014 by Buddy Heins. A 19.6 acre brownfield site along the Interstate 275 corridor has been transformed thanks to a recent expansion by Holston Gases. 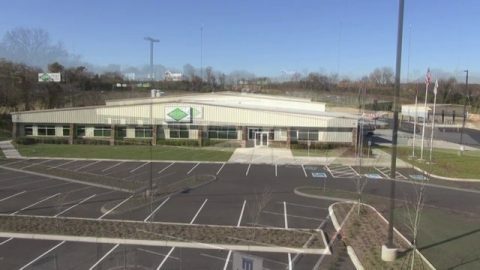 Merit Construction was selected to complete the project, which has approximately 80,000 square feet under roof and features a state-of-the-art compressed gas facility, office, and warehouse. The Holston Gases expansion is a $10 million investment and will eventually create more than 20 new jobs. Click below for an aerial flyover of view of the Holston Gases project. Published on February 20, 2013 by Buddy Heins. Students and faculty at Coulter Grove Intermediate School will start classes this fall in a brand new, state-of-the-art school built by Merit Construction and designed by Johnson Architecture. Located off Sevierville Road in Maryville, Coulter Grove was designed for 1,100 students in grades 4-7. Published on January 18, 2013 by Buddy Heins.